Since before recorded human history, the people of India have had an insatiable appetite for gold, treasuring it not only for its flawless natural beauty and religious significance but also as a superb store of value. This tradition carries on today, with India’s demand for gold jewelry in 2015 reaching more than 668 tonnes, nearly a third of total global demand and second in size only to China. 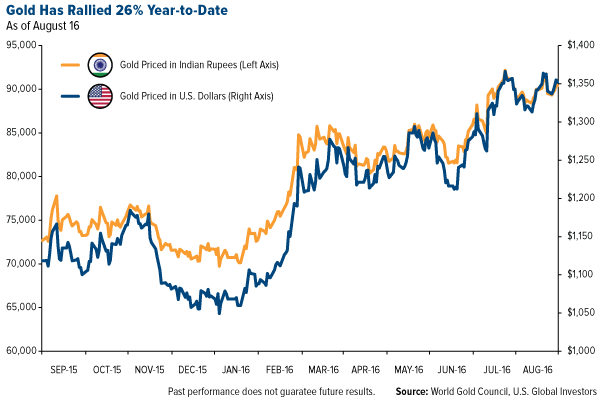 I’ve pointed out many times before that the price of gold is largely driven by the Love Trade in India. Demand fluctuates year-to-year depending on several factors, the two most significant being the number of Indian weddings held in the fourth quarter and the amount of crop revenue that’s generated as a result of the summer monsoon season. The wedding season is still three months away, but the June to September monsoon season is currently in full swing. It’s impossible to overstate just how crucial this period is to India’s important agriculture sector. During an average monsoon season, the Indian subcontinent can receive close to 80 percent of its total annual precipitation. Most reports so far this year indicate surplus rainfall, with 12 inches being dumped nationwide last month alone, the fifth best month since the 1990s. This should come as welcome relief to Indian farmers, whose incomes have been squeezed by two long years of drought. 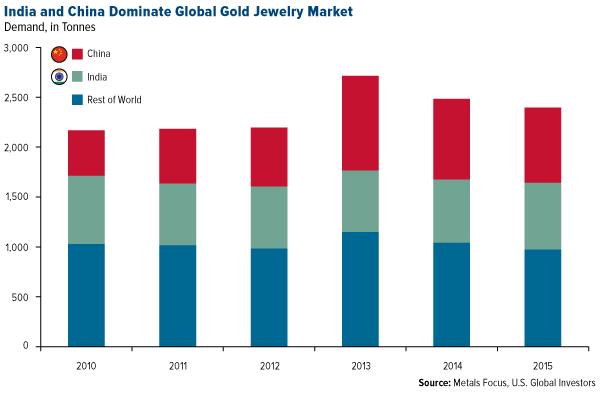 It’s also good news for gold consumption. Because of the above-average monsoon, gold spending in India is expected to increase 11 percent in 2016/2017 over the previous September to August crop season, according to Thomson Reuters. This would help reverse weak second-quarter jewelry demand in India due to a gold jewelers’ strike that closed the market for six weeks early in the quarter, a new 1 percent excise duty on jewelry and rising prices. 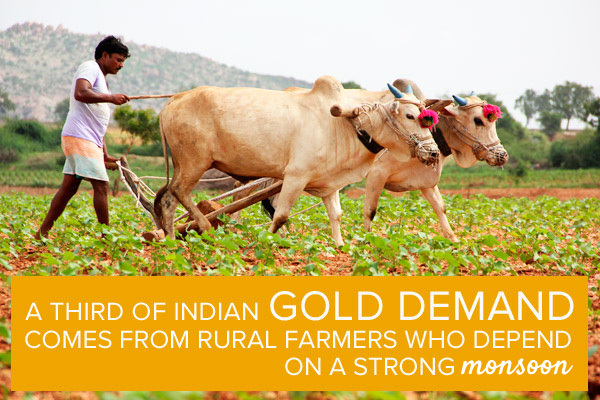 About a third of Indian gold demand comes from rural farmers, who have traditionally converted a percentage of all crop revenue into the precious metal to be held as insurance and sold in times of dire need. A GFMS/Thomson Reuters study conducted last year found that, between 1985 and 2014, there was a strong positive correlation between Indian crop revenue and spending on gold. Following the crop season, we have Diwali and the Indian wedding season to look forward to. Diwali, also known as the Festival of Lights, is arguably the most sacred holiday in Hinduism, celebrated by millions of people all over the globe. Much like Christmas, it serves as a major shopping season. Families splurge on expensive items such as cars, appliances, clothes—and gold jewelry. You can see how, in past years, the price of gold has ramped up in August and September as Indian merchants and jewelers restock inventories in preparation for the fall festival. 150 Million Indian Weddings Between Now and 2021? The largest owners of gold in Indian are women, as it is auspicious to give them gifts of gold jewelry before their weddings. Because India lacks a formal social security system, it’s vital for women in particular to have some form of wealth preservation in the event of divorce or widowhood. This is what’s known as stridhan—a portion of a married couple’s wealth that is controlled exclusively by the wife and to which she is entitled, even after separation from her husband. So how many weddings are we talking about, and how much gold? Let’s look at the numbers. According to the Indian government, there are 300 million Indians between the ages of 25 and 29 from now until 2021. During this period, a projected 150 million weddings will take place. And for each wedding, roughly 35 percent to 40 percent of total expenses will be devoted to gold in the form of bullion, coins and jewelry. 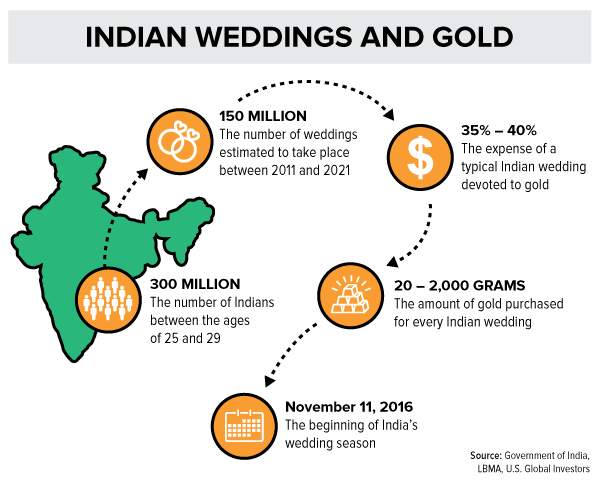 Put another way, it’s estimated that the amount of gold purchased for a typical Indian wedding ranges between 20 and 2,000 grams—equivalent to a little over 70.5 ounces, or $95,457 at today’s prices. The wealthier the family, of course, the more gold they can afford to buy. But gold is just as popular and valued—if not more so—among lower income families, many of whom depend on monsoon rains to nourish their crops. Here’s to a bountiful yield! 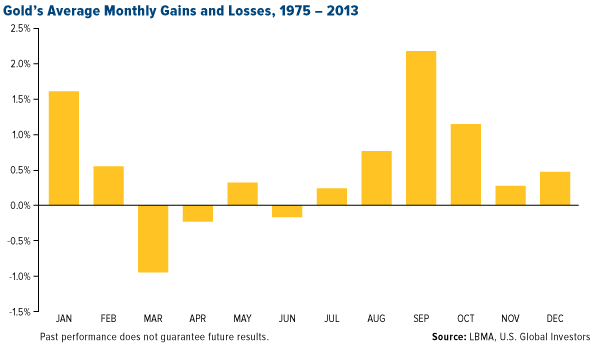 Next Article Fed member statements move gold price up or down. Should this be allowed?